There is one drawback in using microcontrollers: They need to be programmed. If you dont know how to do this or if you dont want to use them at all. I had to dig very deep into electronics history to bring up the following circuits. They have been verifyed working and are good options to using microcontrollers. Both use a flipflop circuit to get things done but are totally different circuits. There does not seem to be a single application you cannot use a NE555 for. If you are new to electronics or only have been looking into music stuff you may not know it. 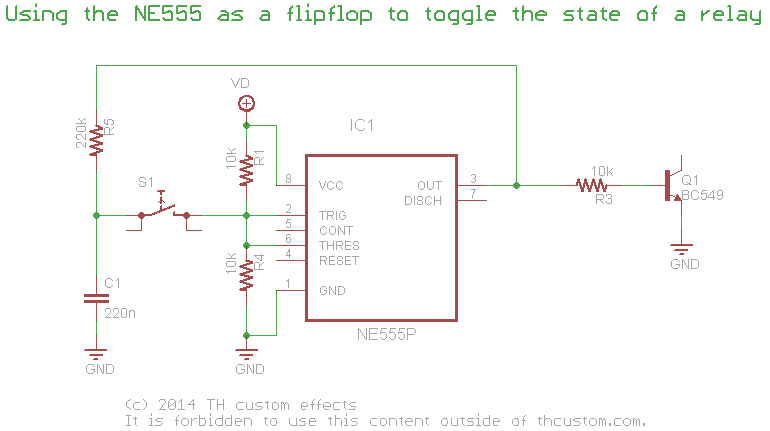 The NE555 is – in its default application – a timer circuit from the beginning of the ’70s. It is famous for the almost unlimited applications that it can be used in. Link to Wikipedia. The NE555 contains an internal flipflop among other things. Pressing the switch generates a peak signal on pins 2 and 6 for a few ms which triggers the internal flip flop and toggles the state of the output . The hysteresis of the 555 limits false switching from switch bounce. To learn more about the 555 circuit you can have a look at evilmadscientists 555 project. The two NAND gates work as work as a simple RS flipflop. 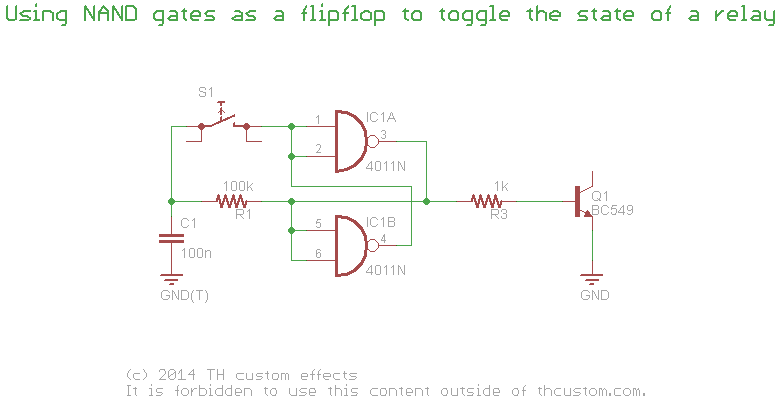 If the switch is pressed the capacitor is either charged or discharged and triggers the flipflop. R1 makes this work as it delays the loading/unloading of the capacitor, eliminating switch bouncing and the flipflop finaly reaches a stable state. The values of C1 and R1 are crucial for this to work. C1 can be doubled for bad switches which have long bouncing phases. 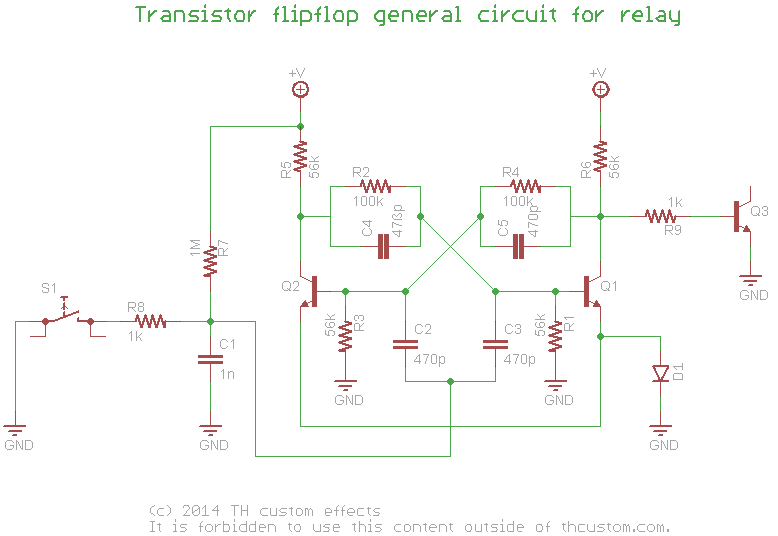 Remember the transistor flipflop in the buffered bypass circuit? Here it is again. For sure it can also control a relay as it already has the necessary voltage levels needed. I need to say that this will work for sure but due to the high parts count involved I never actually build this.